Today police officer Edward Nero was found not guilty on all counts in the case of the murder of Freddie Gray. What is tragic is not simply the lack of justice itself, but the bleak outlook on Gray's family receiving justice at all. However to make matters worse, like clockwork, apologists for extra-judicial murder and state violence are out in force to tell the world why murdering another Black man was "justified." Akin to a real life carnival of death, these apologists prop up red herring arguments to deflect away from the issue at hand. We hear, "what about Black-on-Black crime?" We hear, "Freddie Gray was a criminal." We hear, "Why did he run if he weren't guilty?" All of these excuses are meant to serve a purpose. That purpose is the continued acceptance and tacit approval by many Americans who co-sign and indirectly support the murder and genocide of Black men and women. At some point in time we have to be critical of the people who support such as system. At some point we have to accept that this system just wouldn't exist if people didn't believe the anti-Black lies and propaganda that have become commonplace among a certain segment of the American population. 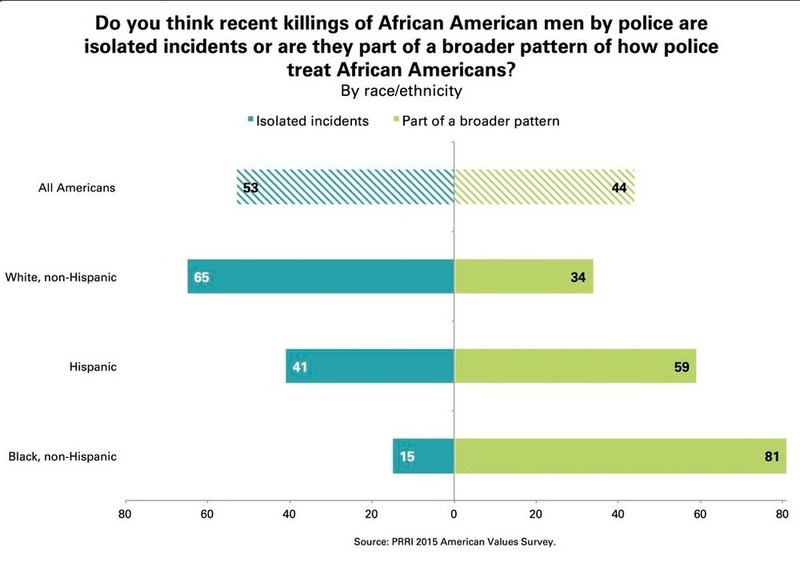 We already know from research like the one shown above the Whites and non-Whites have vastly different views about the killing of Black people. Most Whites appear to opt-in to the belief that all of these incidents are isolated where the Black people were wrong in some way, shape or form. While Hispanics and Blacks view it very differently. Could it be because it's our groups most damaged by extra-judicial murder? I think that has a LOT to do with it and is a serious and problematic source of friction. Can we live in a truly free and fair society when 65% of the dominant group in said society can't acknowledge certain obvious facts and trends? Research from 2015 that was posted on The Huffington Post even showed how differently people view protest based on the protesters skin color. 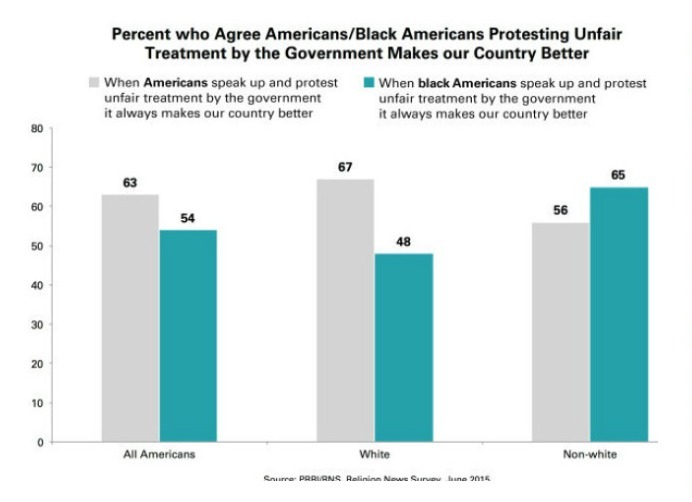 Look at the huge dropoff in support for protest among White Americans when we're talking about all Americans vs. specifically Black Americans. So combining the two bits of research, we're in a situation where not only do people not see the problem, but when Blacks protest said injustices, these same folks are likely to have a very negative view of the protest simply because it's Black people protesting. We see this in how vastly different the media coverage of protests and riots is when it's Whites after a Bowl game or Bundy Ranch extremists and Blacks justly demanding the state to stop killing people. At some point, people have to look in the mirror and ask themselves whether they're part of the solution or part of the problem. It's apparent that right-wing propaganda has gotten to extremely dangerous levels when this many people have a lopsided and out-of-touch view of reality. Yet we wonder how Donald Trump can reach the levels of political success he has had?!? Look at how many Americans can't even be honest about what's going on in their own country!! Freddie Gray was a victim! His family deserves justice and anything short of that is by default unjust. If you can't see that, the problem is not with me or what I'm saying. It's with you and your support for extra-judicial murder.